Why buy Kevin’s Quality Clothespins? 1) They are Made in America! Kevin’s Quality Clothespins are proudly labeled: Made in America! The springs in Kevin’s Quality Clothespins come from an American Manufacturer. Our maple is supplied by a local company. That wood is then handcrafted by The Screwy Carpenter and they are assembled here in the Pacific Northwest. 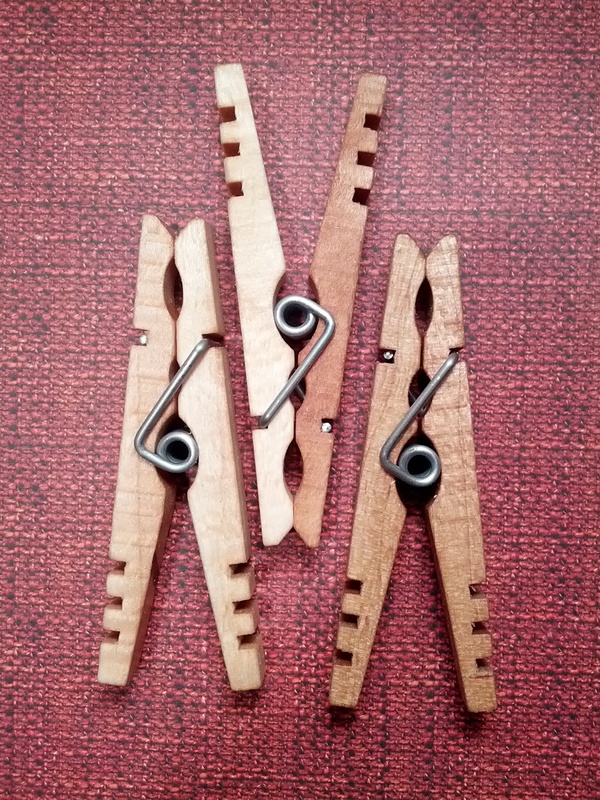 These Classic American style clothespins conform to the traditional style pins first developed by Solomon Moore back in 1887 (also American), but also are an improvement over the old clothespins. A clothespin is worthless without a great spring. Kevin’s Quality Clothespins are made with a heavier gauge of wire then that of the imported clothespin (see above) and it is a fully-wound spring. The springs are made of stainless steel and will never rust. 3) They hold up in heavy winds. Perfect for camping, perfect for natural disaster and prepping. The first video is one we filmed. The Tornado Video was filmed by one of our customers. You may be in disbelief at these videos until you feel our pins in your hand. The weight, the spring, the size all combine to feel sturdy but not bulky, strong but not a struggle to operate. Kevin’s Quality Clothespins are made from maple. This hardwood is enduring, has an even light-colored grain, and does not bleed tannin stains onto clothing. Our finished clothespins are coated with Linseed Oil before being assembled to help them resist weathering. Will the Oil get on my clothing? We have completed several tests using wet, white fabrics and letting them dry over night. The Linseed Oil is soaked into the wood and does not leach out onto fabrics. We also have had a separate company do this same test with the same results. Here is a picture of one of Kevin’s Quality Clothespin next to an imported clothespin. As you can see our clothespins are much more substantial than the imported pin. The total length of the pin is 3-1/2 inches and the wood is cut thicker. The angles of the cuts, the thickness and length come together to make a heavy-duty clothespin. Our clothespin can also be used on a clothes-rod. They open wide and will fit over a 1/2″ dowel. Also, notice that each of our pins have grooves cut into the end to help the user easily grip the pin when using. This is a useful feature but also adds to its beauty. Another difference is that the gripping ends are further apart than on the old-style or imported clothespins. This makes it easier for those who don’t have a lot of finger strength to operate the clothespins. If one of your Kevin’s Quality Clothespin should break due to normal wear or manufacturing defect, return the parts (wood and spring) to us and we will return to you a new clothespin to replace the malfunctioning one. Have you ever heard of any company offering a guarantee on a wooden clothespin? It is not just my family you are helping. The spring company employs many people. The wood mill employs many people. The sticker company employs many people. It is a beautiful circle of mutual cooperation and respect. There is a gentle uprising of ideals that understands we were not built to just comsume and throw away. However you phrase it is fine, it is the idea of taking care of that which was given to us and setting the next generation up for success. Ever had the object that just worked as advertised with no muss or fuss. The one you came to rely on without making a conscience decision. Based on four years of feedback and reviews from all around the globe I strongly believe we will be one of those products for you. As you can see from the above, Kevin’s Quality Clothespins are not your everyday clothespin. This is a clothespin that will outlast and outperform any of the cheap alternatives available. These heavy duty clothespin are made to be put out on the line, and to be loved for their wonderful practicality. We carefully craft our clothespins in the hope they will be handed down to the next generation. Our clothespins, though wonderful, do not have super powers so please read…Kevin’s Quality Clothespins Disclaimer. Goodd info. Lucky me I came across your site by chance (stumbleupon). Hi. I am working on an art project and could use abou 100 pieces of the wooden parts of your clothespins without the metal spring. Would these be available? Rejects or seconds? I ordered some of these and am so impressed. The old fashioned craft clothespins with no spring don’t work for hanging clothes but maybe only as crafts. Nowhere else could I find good CP until now. I’m hooked!! Am going to make sample packets with two pins each to give away and introduce people but those samples only go to people who will appreciate your craftsmanship.!! I got the Factory Firsts set of 10 clothespins. It is a well-made product. The craftsmanship is awesome. Prior to finding this product, I had prayed to the Mighty One of YSHRAL, the Creator, asking Him to help me get right vendors. You see one day, I had to go grocery shopping. Usually my AYSH L BEIT (husband, man of the house) does this. But today was different. I went and while I was shopping for organic fruit, the RYH haQodesh (Breath of the Creator) nudged me to look at the sign above me. I did and was shocked. I read the sign and it said they put Lac Resin, beeswax or petroleum on some of the fruits and vegetables. None of these are acceptable for my diet, as I eat kosher foods only (not kosher by religious-elite standards, but strictly by the Word). I did cry (QRAY, in Hebrew) to the Creator, Hayah, asking Him to give me right vendors. Then one day I found you. You are a right vendor. Your product is of real materials (that the Creator created, not man-made , fake materials). Your prices are right (you are not greedily tipping the scale). I appreciate your product, your business morality and I am grateful Yah showed me you. The clothespins are the best and beautifully made. In the Printmaking Department at the Rhode Island School of Design, we built wooden racks that suspend on clothesline ropes and work on a pulley system to raise up above our heads to save space. Clothespins nailed to each side of the rack were to hold drying prints and large, wet cotton blotters. The clothespins initially nailed to the rack wouldn’t hold a sock and everything kept dropping until we discovered Kevin’s Quality Clothespins. The racks are now functioning beautifully and will last in our printing shops for centuries! Thank you Kevin! Thank you Lady and the Carpenter! I live in the middle of a Midwestern wind farm, as in every direction of my home has views of turning wind turbines. The wind never stops here and in fact is quite strong most of the time. I hang out 2-3 time a week year round. These pins are simply the best available! Thank you Kevin for producing such an amazing and quality product! I will be purchasing more pins for a friend and several more packages for myself! Thank you again for the fine craftsmanship!!! Reading about your product intrigues me. My husband and I are interested in trying your clothes pins and would like to order 10. We are also interested in your seconds pins. Could you tell me how to order. We don’t use PayPal. Go to our store http://secure.ladyandthecarpenter.com/shop/Clothespins/, put what you want in your cart. When checking out you enter your payment information at the bottom of the screen (scroll to the very bottom) Your payment will go through Bluepay (our payment processing company) Payments only go through Paypal if you push the Paypal button. Are the seconds covered under your warranty? And what type of defects can I expect to have with seconds? Are they still fully functional? Bought 1 packet of seconds pins. Realized immediately I needed 2. When I need a Clothespin Basket, I will certainly buy one here. Once you realize the quality, you won’t buy anywhere else. I look forward to ordering my clothes pins. Do you also make other laundry related items? Thank you for your order Nancy! I see you found our store at https://secure.ladyandthecarpenter.com/ We offer not only clothespin related items but also French Style Rolling pins, Pot holders, aprons and wood toys. We will be adding new products (like mallets and cutting boards) later this year. I just placed an order for another 50 clothespins to go with the 50 we already have. They are large and durable–anyone that comes to my house that hangs clothes are amazed at them! Hi, I would like to order 100 or your clothespins, any promo codes available? Thx.. These clothespins are fantastic! It’s so nice to find clothespins made in the US, and these are nice and sturdy, the like of which I haven’t seen since I was a kid. Quality work, indeed. Thanks so much. Thank you for your inquiry, I think you have us confused with someone else. All of our pins are sold preassembled. I came over from Common Sense Home where a 20% discount was offered. I need 110 of these (for a project) so please contact me with to redeem the discount. Seconds are fine as well. Also, would the linseed finish prevent me from painting them? I really need to paint them for this project. triciarichner@tricia16designs.com Thank you!! Tricia, Thank you for your inquiry. I will send you an email regarding all of your questions. As for painting, If you use oil based paint you will be fine but if you want to use water based paint you can order pins without oil on them. They will be available on the website in a couple weeks but you can special order them from me now. All the info will be in my email. I grew up in an age when everyone had a clothesline and hung out their clothes. Aside from a few years of apartment living, I’ve always had a clothesline outside and a drying rack inside. All this just to say that I’ve seen a LOT of clothespins in my life. But I’ve never seen any that come close to the quality of Kevin’s clothespins, not even 60 years ago, when everything my family purchased was American made. I just wish Kevin had been born earlier so that I could have started using these when I was younger. As is, even if I die of old age (and women in my family live to 100), these clothespins will still outlast me. And unfortunately I don’t have any family members with the good sense to get a clothesline! That is fabulous! I love to write. Good luck on your site. These clothespins are a simple work of beauty. They feel so different from the cheap version and are solid and functional. These clothespins will last a lifetime! These are the BEST clothes pins and made in the USA. I love them. We ordered one of the factory seconds to try out and it is AWESOME! I only needed one to hold up my jeans that my cheap crappy plastic ones took SIX to accomplish. I am placing an order today for more. Seriously these are the best clothespins you will ever find. Is there a way to send you a check or money order instead of using pay pay? These are really good clothespins! I truly believe they will last a lifetime if not longer. They are a great investment, and plan on buying more. 🙂 Thank you for the great quality! We are finding all kinds of creative ways to use our clothespins. I dont own a clothesline (wishing I did now) but that hasn’t stopped us from finding all kinds of useful things to do with them. They are on our chip bags and holding up holding up our miniblind strings so no one gets strangled. Also we have them holding notes for me on my fridge and on my desk. Im sure we will come up with other ways to use them as time goes on. Thank you for your beautiful craftsmanship. These are heavy duty clothespins. I used them on a large nylon rope to hang up bath towels. Very sturdy. They don’t string apart. Thank you… can’t wait to try your pins. I would love to know if you are still in business? ?